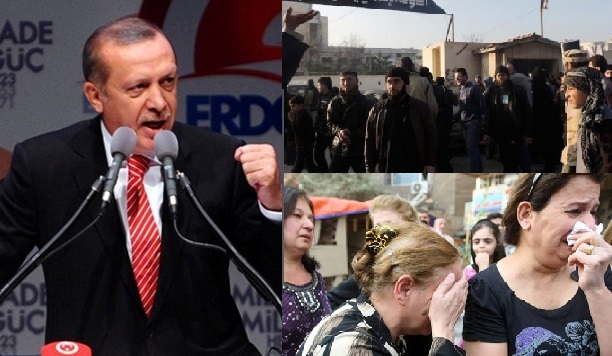 JNN 9 Aug 2014 Baghdad : The government of Prime Minister Recep Tayyip Erdogan has acknowledged significant recruitment of Turkish nationals by Islamic State of Iraq and the Levant militant group in Iraq and Syria. Officials have told Turkey’s parliament that at least 1,000 Turks were fighting with ISIL terrorists in Iraq and Syria. They said the Turks, offered lucrative salaries, were recruited in mosques, schools and even from the security forces. “ISIL is recruiting throughout the region, and Turkey is no exception,” an official said, who asked to be unnamed. The figure was released in wake of allegations by the parliamentary opposition that Turkey was being used for ISIL terrorist group recruitment and training. The opposition cited videos that showed purported ISIL Terrorists at a celebration outside Istanbul in late July. Turkey has long been accused of tolerating ISIL as part of efforts to maintain the war in neighboring Syria. Opposition sources said Turkish intelligence facilitated the supply of terrorists and weapons from Turkey to Syria. “The Justice and Development Party has shut up when faced with the ISIL terrorist organization, and still says nothing about it,” opposition leader Faruk Logoglu said on Aug. 4. The rise of ISIL has resulted in sectarian attacks in Turkey. They included an attack on a Shi’ite mosque and reports of recruitment of Turkish nationals for the war in neighboring Iraq. So far, the government has not responded to opposition demands to disclose ISIL activities and whereabouts. Instead, Erdogan and his aides have complained of lack of NATO support to help control Turkey’s huge border with Iraq and Syria. “Before it is too late, the intelligence and security forces must be on full alert to stop the growth of these extremist groups, recruitment to ISIL or other terrorist organizations, while the government should issue strong statements that it won’t tolerate these inclinations in a multi-ethnic, multi-religious and multi-sect society,” the Turkish daily Hurriyet said on Aug.2. The ISIL militant group took over Iraq’s largest Christian town Qaraqosh and surrounding areas on Thursday and sent tens of thousands of panicked residents fleeing towards autonomous Kurdistan, officials and witnesses said. ISIL militants moved in overnight after the withdrawal of Kurdish peshmerga troops, who are stretched thin across several fronts in Iraq, residents said. “I now know that the towns of Qaraqosh, Tal Kayf, Bartella and Karamlesh have been emptied of their original population and are now under the control of the Terrorists,” Joseph Thomas, the Chaldean archbishop of Kirkuk and Sulaimaniyah, told AFP. Qaraqosh is an entirely Christian town which lies between Mosul and Arbil, the Kurdish region’s capital. It usually has a population of around 50,000. “I heard some gunshots last night and when I looked outside, I saw a military convoy from the Islamic State. They were shouting,” he said. After the so-called Islamic State of Iraq and the Levant (ISIL) issued a threat that all Christians in Mosul must convert, die, or flee, most chose the final option and escaped IS held territory. 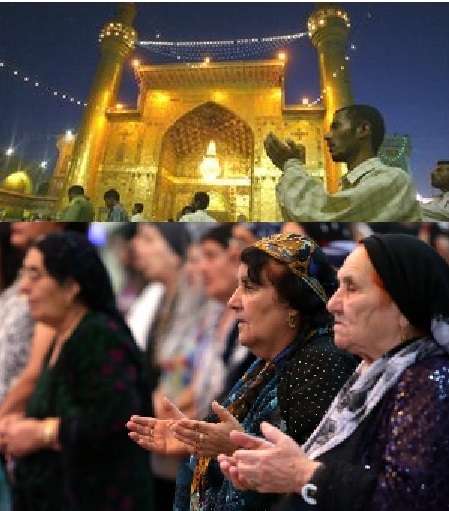 Heading towards the southern region of Iraq, which is relatively safe, the Christian community was met with offers of safe haven in the cities of Najaf and Karbala, which house some of the holiest shrines of Shia Islam. Reportedly, the offer is also available to Sunnis, Kurds and all other Iraqis fleeing violence at the hands of ISIL. Following the announcements, the Iraqi city of Basra also opened its facilities to displaced Christians, and is reportedly hosting approximately 100 families from surrounding regions. The shrine is the site of the final resting place of Imam Ali ibn Abu Talib [AS], son-in-law of Islam’s Last Prophet Muhammad [PBUH]. Also inviting refugees is the nearby city of Karbala, home to the shrines of Imam Hussain [AS] and Abul Fadhl Abbas [AS], two sons of Imam Ali [AS]. This entry was posted in Jafria and tagged Islamic State of Iraq. Bookmark the permalink.